For those of you creating slices, we’ve added support for small (cue-sized) noteheads. Some people like to use these to specify notes are optional — for example, optional harmonies. You have two ways to use small noteheads in your slices. 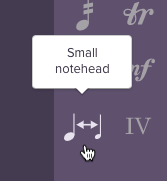 First, using our notation editor, select a note or notes, then click the “Small notehead” icon. Second, for those of you notating in other programs and importing MusicXML into Soundslice, you’ll be happy to know that our MusicXML importer now detects small noteheads and does the right thing.